GDR means General Distribution Release. They are released to the public on Windows Update and other places. LDR/QFE updates ( Limited Distribution Release and Quick Fix Engineering ) are on another "branch" of development, and sometimes have to be requested. They usually are created to fix specific problems. Think of it as "testing": you have the latest fixes, but also potentially new bugs or regressions. The KB posted on Windows Update contains the two branches, so once you have installed LDR/QFE hotfixes, you're staying on this branch. (until the next service pack or if you uninstall any updates on LDR/QFE branch). As far as which branch to use, it's really a matter of personal preference. Some prefer the GDR branch as there are fewer updates to integrate and they are slightly more stable, though they are not immune to issues. Others figure that all of the LDR/QFE updates will eventually be rolled into the GDR branch anyway, or the next SP if there ever is one, so you might as well be prepared. While there is a very small risk that new bugs are introduced, the cases where that has occurred are rare and they are usually corrected quickly with yet another update. LOL I personally have not run into a problem using the LDR/QFE branch. Guys, let me know if it works correctly or there's anything to change/add. Please note it only uses the ANSI versions of the API and some of the functions are not complete, so there's no testing available yet. This is what Microsoft and MDGx uses, depending on the situation. MS, that's for sure. MDGx , I don't think so... see this page. However it's true that the GDR branch is the safer one to use (and bphlpt's post two posts above this one explains in more detail what's involved). @Drugwash: that's great news! I'll be testing it as soon as I manage to reboot into 98SE. Thanks a lot! MS, that's for sure. MDGx , I don't think so... see this page. However it's true that the GDR branch is the safer one to use. True enough. Myself, I use preferentially QFE. I've had to fall back to GDR in one case already, but it really is a very rare happening. I was using import patcher to see if I could get Adobe Audition 1.5 to run. I ran Audition.exe through Importpatcher.37 and then ran the modified file (auditio#.exe) and got the error "Error loading language module". Looking at the import patcher logs, it seems that I'm missing apphelp.dll. I obtained that file and placed it in c:\windows, c:\windows\system, and c:\windows\system32, as well as the directory where I have import patcher (IP). I ran IP again, and this time it created apphel#.dll which I'm not sure what to do with. Auditio#.exe still gives me the same error. So am I supposed to replace apphelp.dll with apphel#.dll? What do I do with ipstub.dll? Is there any hope of getting audition.exe (or auditio#.exe) to run? (yes I have KernelEx installed). As I wrote in the other thread (the Audition 1.5 one), Audition 1.5 doesn't run under 9x. You will have however no problems running 1.0 which is essentially a repackaged CoolEdit Pro 2 and can be used under stock 9x/Me AFAIK. That's what I would suggest, find yourself Audition 1.0 or CoolEdit and use that. > So am I supposed to replace apphelp.dll with apphel#.dll? ... What do I do with ipstub.dll? > Is there any hope of getting audition.exe (or auditio#.exe) to run? (yes I have KernelEx installed). You might have better luck using Kexstubs, but you're probably best off taking loblo's advice. I've been using ImportPatcher.38 for a long time now, so it's about time I post it! The key new feature is that Delay-load processing is now optional and defaults to OFF. For Kexstubs users, this is great for finding the minimal set of missing APIs that need to be added to stubs.ini (or Kstub822.ini). ImportPatcher.39 is a first attempt at moving towards a dialog interface. 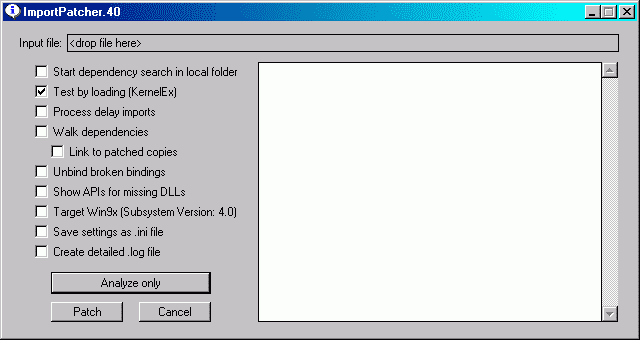 The initial MessageBox is replaced by a dialog box and the settings section of the #.ini file has been removed. (In fact, if there are no missing dependencies, the #.ini file will be empty!) The log file output remains the same. Testing with Firefox 10.0.12 and KernelEx 4.5.2 official I get no patches needed in the results window, however the FileInfo plug-in (Total Commander) shows GetProcessIoCounters missing from kernel32.dll. Same missing API for Firefox 9.0.1 on the same system, however ImportPatcher40 does show it this time in the results window. Both firefox executables are in 'Default' compatibility mode. But... v10 is UPXed, while v9 is not, therefore I'd say unUPX would be necessary. Thank you for the new version! The latest Gimp (2.8.4) has files with bogus internal build timestamps (1970, 2040, etc.). ImportPatcher.41 can now handle them. In case that doesn't work, one of the controls was resized so it should look better anyway. UPXing an app with standard parameters converts all dependencies but the first API of each DLL into delay-loads that can currently only be detected by profiling. In the case of FF10, GetProcessIoCounters is provided by kexbases so it's not a problem. In addition to the cursor changing to an hourglass during processing, the Analyze and Patch buttons and large text area are now disabled (grayed) as well. All return to normal to signify when processing is done. This is a very minor release, so major changes such as Ordinal support and better logging options will have to wait. Also: Invalid timestamps and file alignments are detected and reported in the log (if enabled), but not reported in the ini file/text box. Older features "Link to patched copies" and "Unbind broken bindings" have not been tested recently and may not work! Appearance is now correct under RP9, disable/enable buttons during processing also works and should be enough of a hint. For non-relocatable EXE's and DLL's, insert the needed four bytes of code somewhere and bind the import linkage to Kernel32.dll using our code address for these two functions. For relocatable DLL's, the relocation table will need two new entries (the bound address locations) added to it. For portable apps that need to run with different versions of Kernel32.dll, binding isn't feasible so the functions need to be renamed (or changed to ordinals) and additional startup code is needed to patch on-the-fly. This could be done in-place if the Import Address Table is in an executable section of memory. Initially just for the first case above. Also, "Unbind broken bindings" last worked in v.39. This should be reviewed and fixed. Msvcr80.dll is available (or can easily be patched) for Win9x. I've successfully used the 90 and 100 replacements several times.